Home Games UNO! Games Like UNO! The game that had “caused massive family squabbles” and “feuds between friends” is back on your mobile devices! UNO doesn’t only offer the good old gameplay that you know and love, there are plenty of other game modes that you can enjoy, whether it is a team-based 2v2 game or a Go Wild match that can get brutal fairly quickly. If you’ve always loved a game of UNO, this app only makes the classic card game a lot more mobile and a lot more entertaining for you! To start playing, you can choose to login via your Facebook, Google or Mattel 163 account just so you’ll get to save your progress in the cloud. This also means that you’ll be able to access your account on other devices you may have. You can also jump right into a game, without logging in, but know that if your device decides to suddenly keel over, you’ll have to start from scratch after installing UNO on your replacement device. UNO also comes with a really simple, interactive tutorial designed to quickly get someone who has never played UNO before into a game. However, if you really want to learn some more advanced skills, such as calling out your opponent if he or she doesn’t call out “UNO!”, you can access all the extra tutorials through the game’s Settings. Not to mention, you can earn some free coins by playing these extra tutorials as well. Coins are the bread and butter of this game, mainly because you’ll need them in order to play UNO in this app. It works in a similar manner as the energy system that many games use to regulate their players’ progress. In this game, you can easily get a nice pile of coins and other freebies simply by logging in daily and staying online, completing achievements, or by spinning the daily wheel. You can even earn scratch cards by completing the daily quests. These cards usually reward you with boosts or more coins, but sometimes, if you’re really lucky, you can get free room keys which will allow you to set up private game rooms so you and your friends can play UNO together. 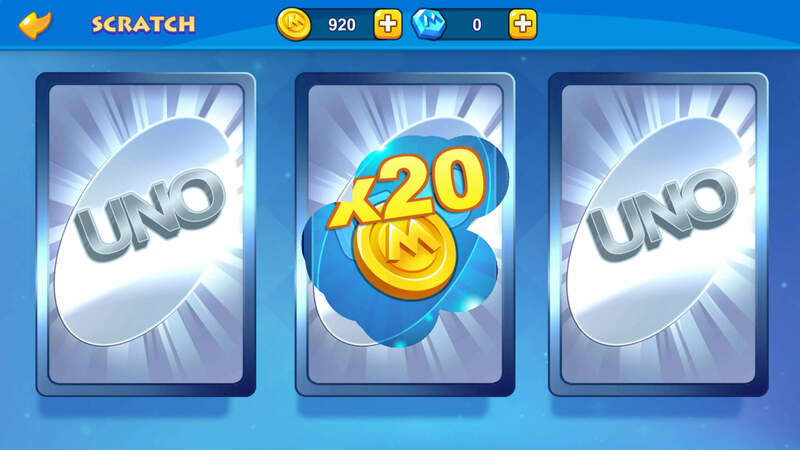 Boosts in this game functions in a very fair manner to both spenders and non-spenders, because they only affect the number of bonus coins you’ll get if you win a match (the Clovers) or the coins you’ll lose if you lose a match (Wildest Shield). Different boosts work for different game modes – this is indicated by the color. In terms of the actual gameplay, UNO stays true to its core, giving players the same feeling of excitement and fun similar to when they are playing the original card game. However, the app version imposes a time limit on each match, allowing only a maximum of 3 minutes per match. If there’s still no winner once the time is up, then the game will calculate the value of all the remaining cards and the team or individual with the lowest number will win. But of course, the reward for winning outright versus winning because you have the lowest number isn’t the same – you’ll get more coins by winning outright. The time limit added is a great feature to prevent an UNO game from dragging on for way too long. The app is designed to offer some quick UNO games that you can play while on the go, after all! Fun fact: the longest UNO game ever played is currently set at 3 hours and 10 minutes, and we definitely won’t want that to happen in this game! Not to mention, UNO comes with several game modes that you can enjoy in addition to the usual free-for-all gameplay. You can choose to play as a single player or play in teams consisting of two players each. In the 2v2 mode, if your partner wins, you will win the game as well so it makes sense to help each other to best the other team, so basically, you’ll have a 50% chance of winning a game as opposed to the original 25%. Aside from the classic UNO game, you can also enjoy the game’s Go Wild mode whereby two packs of UNO cards will be used. This game mode has a lot more action cards, greater coin multiplier and you can even discard all cards of the same color at one go. This makes for a much faster and more brutal gameplay. 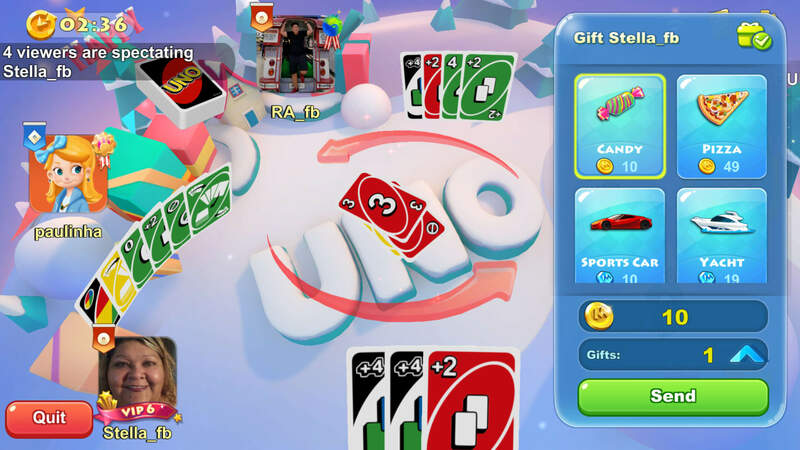 There’s even a tournament-style game mode called the UNO Contest, where players can play for the champion trophy. However, unlike other game modes, the contest is only open for a limited duration every week, so be sure you don’t miss out! Matchmaking in this game is fairly fast as well, so there’s little to no downtime in between matches. Being a freemium game, you can help support the game by buying diamonds (premium currency) using real cash or by watching video ads. In fact, if you recharge – spend real money – in the game, you’ll get a fantastic First Top-Up Package which contains a lot of goodies! UNO is a very social game. You can add friends to your friends’ list and invite your friends to join you in a private game room for a match. You can also use the app’s Party Mode to play UNO with your friends if they are physically nearby since it uses your device’s GPS to detect other nearby players. Most interestingly, you can actually save your replays and share them for all to watch. You can even watch other players play, regardless of whether or not they are your friends, via the Spectating option. While spectating, you can buy the player you’re spectating some gifts using either diamonds or coins. The bright and colorful graphics in this game give it a fun and cheerful atmosphere. The card effects are fantastic and every animation works very smoothly. The game has a cheery and upbeat tune and some voice acting as well. 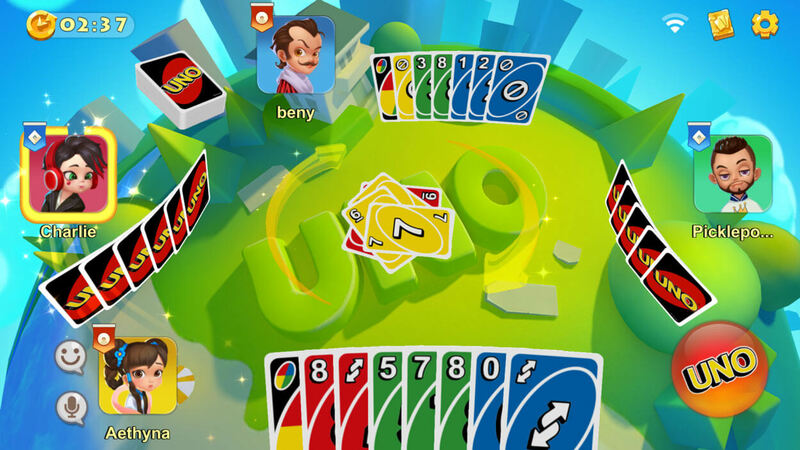 All in all, UNO is everything a fan could ever want in an UNO mobile game. It’s not only fun and has well-varied game modes to keep things fresh and interesting; the game is also very social, allowing players to meet new friends – friends with whom they can play a private game of UNO with later on. The spectating feature is a nice addition to the app as well.